Truck driving, without a doubt, is one of the most important career opportunities within the United States as the industry accounts for moving 70 percent of cargo along with an incredible 56 percent of America's gross domestic product (GDP). This translates to an industry worth $725 billion and employing 1 in 16 people within the United States. While to many a trucking job may seem like the perfect opportunity, drivers still face a vast swathe of dangers that impact their daily life. Dangerous weather and road conditions are one thing, but recently there has been an increase in cargo theft in the news. Recently, cargo theft has come back into prominence as three men were convicted in Georgia on Tuesday for a case occurring on November 23, 2014. According to police, the men stole a semi truck which contained around $150,000 worth of batteries. District Attorney Brett Poston stated that it was the Miami Dade Cargo Theft Task Force and the GBI Major Theft Unit who were able to properly identify the three men to some of the missing property and then to the stolen vehicle and other property. The men who were convicted of the crime stole the trailer from a gravel lot close to the intersection of I-75 and Ga. Highway 201. The trailer was discovered to be missing on November 23 by the driver who had left it there just two days before. While it is obviously never a good idea to leave a trailer full of cargo abandoned, the driver guaranteed that before he had left the trailer there, he had locked the doors of the trailer with a padlock along with making sure the air brake connection was locked. Upon returning to the trailer, he noticed that the seal that had been on the doors had been cut and that the air brake lock had also been broken. The special agent in charge of the case said that he did not blame the drivers for their actions, especially as they had taken what they saw as the necessary precautions before leaving the trailer behind saying that truck drivers are usually under the impression that because they have left their trailers in locations before without a problem, they feel as if nothing will ever happen to them. Due to the sheer number of cargo theft and attempted cargo theft occurrences, authorities in the Georgia-Florida area are highly trained to deal with such cases. In this case, Georgia and Florida police were able to work together in order to track down some of the cargo and then trace it back to the assailants. While this trio of cargo bandits have been caught and found guilty, it is far from fixing the problem of cargo theft. This becomes apparent as late last month, multiple arrests were made in a cargo theft ring occurring again in Florida and Georgia. While this case is still under investigation, some of the facts that are known are that three men stole not only stole trailers and cargo, but also entire semi trucks in order to access the merchandise they were loaded with. In this case, more than a million dollars of beer, refrigerators, energy drinks, and power tools were taken. Interestingly enough, instead of like with many cases of cargo theft, these items were not sold simply on the black market. Much of the stolen merchandise was transported to an individual's auction house and discount store to be sold to seemingly unsuspected buyers. Three men, including the man who owned the auction house and discount store, were arrested for the crimes, but one still remains at large. Sadly, these are only two of the many, many cases of cargo theft that occurs each year. 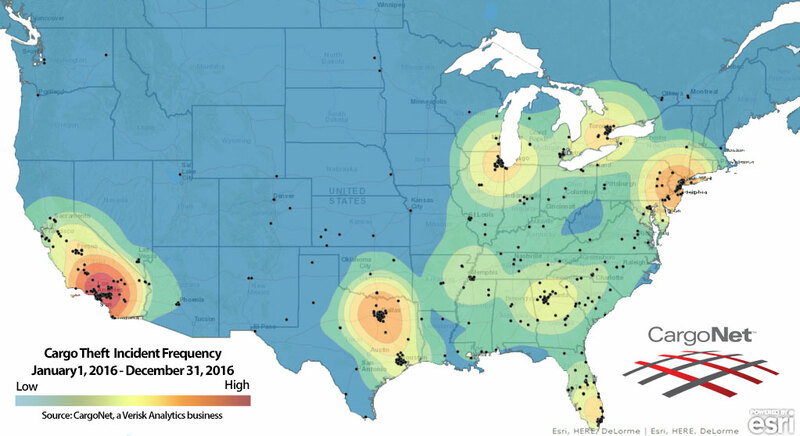 While Florida and Georgia both rank within the top 10 states most affected by cargo theft, nationwide, trucking companies lose close to $30 billion worth of cargo, and therefore revenue, each year due to these crimes. Oddly enough, it is not always the big ticket items like televisions and other electronics that thieves go for. Often times it is stuff that is easy to quickly get rid of such as alcohol, seafood, and even home décor. According to the American Journal of Transportation, in 2016 alone, 1,614 cases of “...cargo theft, heavy commercial vehicle theft, supply chain fraud, and other intelligence events across the United States and Canada were logged...” Over half of these, 836, were just pure cases of cargo theft. While this crime has a tendency to fluctuate throughout the years, last year saw an eight percent rise in tractor theft as it came in with 623 trailers being stolen. Trailer theft saw a similar increase in the number of thefts with a rise of four percent, with 732 trailer thefts. If these numbers were to be translated into a monetary amount lost, with the 836 cargo thefts averaging at about $206,836.97, that would account for a loss of $172,915,707. As mentioned above, the category food and beverage has seen a rise in accounting for what sort of items are stolen and came in as the most stolen last year with 217 cases of theft. 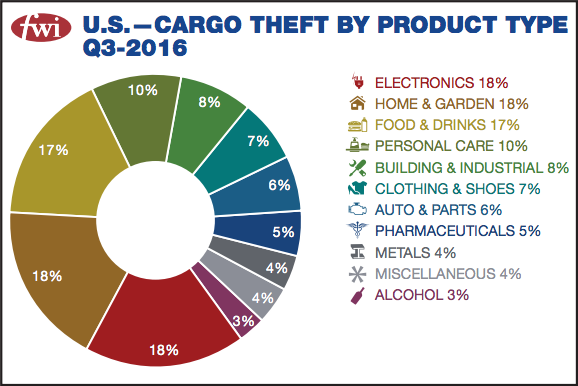 One of the most interesting facts that came out of the study of cargo thefts last year is when the most cargo is stolen. With many trucker job options taking breaks on Friday and/or Saturday, it saw the most cases of theft, while the busiest days on the road, Monday and Tuesday saw the most reports for theft. Simply because Florida and Georgia have most recently been in the news for theft of cargo, does not mean they are the only states largely affected. In fact, the three states with the most reported cases of cargo theft in 2016 were California, Texas, and New Jersey, respectively. While Georgia came in fourth on the list, they also saw a massive decline of cargo theft from the numbers in 2015 – an incredible 64 percent drop. This is mostly due to new laws enacted by the state. The law, which went into effect July 1, 2014, has separate provisions for both controlled substances and other cargo based on the monetary amount the trailer was hauling.For example, as for the case first mentioned of the three men who had stolen $150,000 worth of batteries, each could face between five and 20 years in prison along with fines between $150,000 and $1 million. Most truckers know to take precautions to ensure they are safe from cargo theft, but it is always a good idea to be reminded of a few of the basics. One of the most obvious is to not let cargo sit unattended for an extended amount of time. The longer cargo sits, the more time thieves have to plan an effective heist. Also, aside from ensuring that all doors and other necessary parts of a semi truck and trailer remain locked, it is also a good idea to take precaution as to parking. Experts say that one of the easiest ways to protect cargo is to make doors harder to access. Another parking tip is to try and park in areas that receive a lot of traffic such as busy parking lots as they are more likely to have cameras and open eyes. One tip, which is fairly less obvious, is to pay special attention to cargo during long, holiday weekends, as this becomes a perfect time for criminals to commit cargo theft. 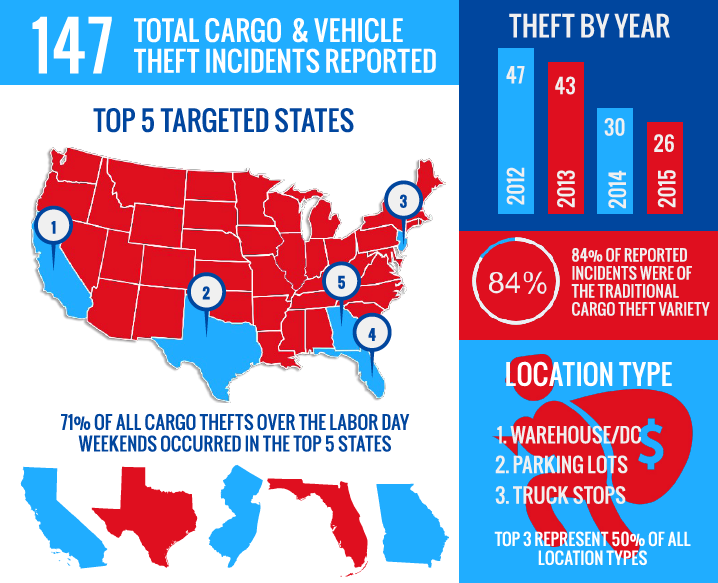 In fact, between 2012 and 2015, Labor Day cargo theft incidents accounted for about $159,654 in losses. Another tip to be considered if individual drivers or fleet owners feel it necessary is to take an extra step and install an alarm based surveillance system to the truck. There are also more heavy duty anti-theft technologies available, such as immobilizers and cargo tracking. Of course, fleet owners should take precautions, too, when it comes to preventing cargo theft. While it is up to the truck driver to ensure they take the necessary steps to prevent the physical theft of cargo, it is up to owners and those who train drivers to make certain that the drivers know of and how to utilize these steps to perform the safest delivery. 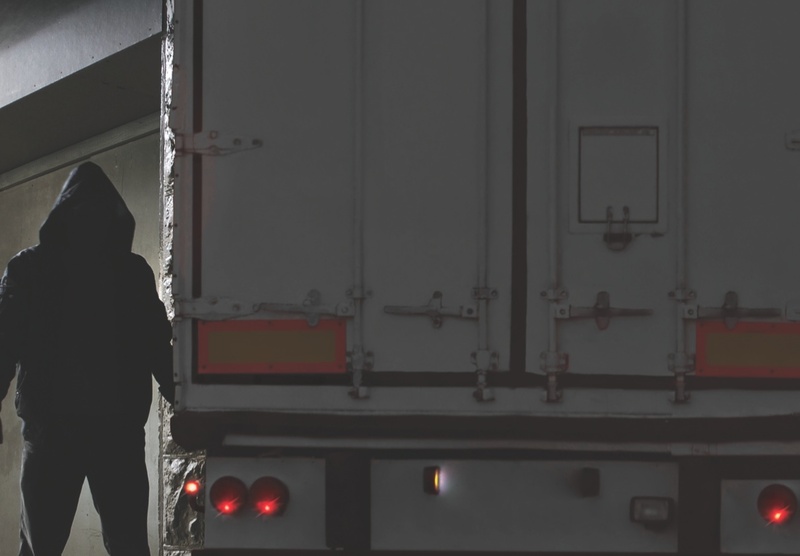 One expert in the field of cargo theft prevention says that by making sure drivers are properly trained, it safeguards the five assets which matter most to one's truck driving job: the employee, trailer, tractor, cargo, and customers. Drivers can also rely on the advice and experience of other drivers - Allie Knight offers some great insight into diligence on the road. Truckers, no doubt, have to be some of the most hyper-observant drivers on the road to ensure their safety, as well as the safety of others and their cargo – no matter the price. By taking precautions and ensuring they understand how to protect their cargo, it is much less likely they will become victims to cargo theft. While there is absolutely no excuse for people who decided to put others at risk in order to steal from others, it becomes a very obvious reality that no semi truck is safe from becoming a victim at any time. Whether a driver is parked in a busy truck stop in California or an empty highway in Missouri, most of these criminals are able to get away with cargo because it is a crime of opportunity, not because the driver is at fault.